Home » WHY Native Plants? Why Native Plants and Naturalization? Our yards are excellent locations for helping re-establish natural communities that existed here prior to European settlement. Development threatens global ecology as more and more species are being pushed out of their natural environments. The loss of any species results in an irreversible effect on all others, including us. Over thousands of years, species have developed adaptations to thrive in this climate and environment as well as close relationships with all other living things in their communities. Bringing back threatened native plant species will gradually allow wildlife dependent on them to return. Assess the area you would like to naturalize as sunny, shaded, or partly shaded, moist or dry and select the species accordingly. Many plants will tolerate a variety of conditions. 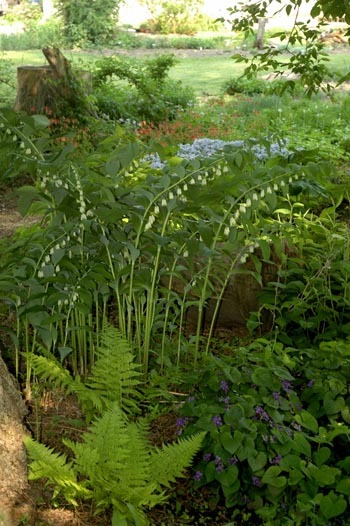 To research what native plants would grow in your yard, check out natural places similar to yours in parks and conservation areas close to you or visit the Natural Themes demonstration gardens just west of Frankford, Ontario. Taking plants from the wilderness is a threat to natural communities. Plant rescues from areas that are being developed or threatened helps ensure their survival provided they are replanted into similar environments. Natural Themes’ Native Plant Nursery primarily acquires stock by seed collection, taking cuttings and by division of plants in the Natural Themes gardens. Other stock is purchased from a tree and shrub nursery or originates from tractor trails and edges of fields where plants collected are threatened by vehicle use and a farming operation.